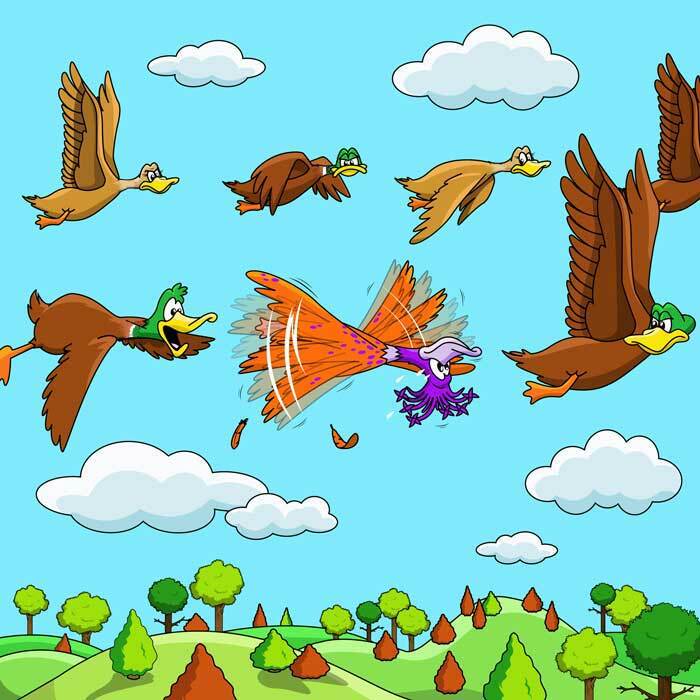 The first concept color illustration is for “The Duck Who Flew Upside Down”–the story that is scheduled to become my fourth book to be released. It appears at this point that “Duck” will be about 10 pages longer than my earlier books, and contain nearly twice as many full-color illustrations. My illustrator and are scheduled to walk through the completed storyboard tomorrow afternoon to plan each scene to be illustrated and where it will be placed within the book. The second concept color illustration is for “Alex and Mean Old Grumbly Grumpadinkle” which may become either my fifth or sixth book. I haven’t decided whether to release it or “Zach and Todd, the Toad Who Road the Bull” first. At this point, both are rhyming stories, while “Duck” is written free-form. This entry was posted in Children's Stories Under Development, My Creative Process, Self-Publishing Books and tagged Alex, Alex and the Mean Old Grumbly Grumpadinkle, animals, author, children's book, children's books, children's stores, duck, Duck who Flew Upside Down, Eileen, Eileen Duck, Eileen the Duck, fun, Grumbly Grumpadinkle, humor, pet kindness, pet kindness named Love, Wilbur Duck, Wilbur Malaard, Wilbur the Duck, writer. Bookmark the permalink. Thank you for your feedback, Ute. Yes, sometimes kindness and love can take people aback, while some will be cynical and wonder why a person is being nice to them, and for the Grumbly Grumpadinkle’s of the world, kindness and love can be so foreign as to initially even horrify them. Luckily for Ms. GG, her feelings of horror, surprise, anger, indignation, impatience, arrogance, dismissiveness, distrust, and all the other things that have built walls between her and feeling connected to others will prove no match to young Alex and his pet kindness named Love. Thank you, Mimi. I agree. May the quality of my stories measure up to the greatness of Josh’s illustrations. I don’t think you need to worry about that at all Russ – it’s your words that enhance these drawings and make them come to life! Thank you for your comment regarding my words bringing the illustrations to life, Mimi. I believe that like lyrics and music, words and illustrations often enhance each other. I know that you do too. This reply is probably going to be out of sequence because once again my “reply” button is missing below someone’s latest reply. In this case it is yours, but it happens with replies from others as well, and only sporadically. I’d like to know why that happens and what I can do to fix it.